Biju Patnaik Institute of Technology Offers 3years Regular Diploma Engineering courses with Intake-capacity of 360 students per year in five disciplines. The Institute is duly approved by AICTE, New Delhi, recognized by Industry Department, Govt. 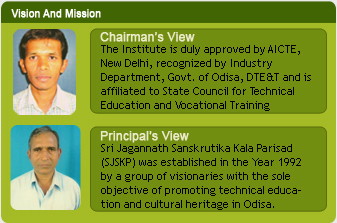 of Odisa, DTE&T and is affiliated to State Council for Technical Education and Vocational Training (SCTE&VT), Odisha, Bhubaneswar.